We do all of our own blasting and painting work on site. Our blasting facilities consist of more than 5000 sq. ft. of covered blast yard with multiple media types (ie. sand, garnet, black beauty, aluminum oxide, etc.). We also have a fully enclosed indoor blast cabinet for delicate precision equipment available as well. Our painting is done in two climate controlled paint facilities totaling 7800 sq. ft. that is heated and explosion proof. We utilize the necessary equipment for measuring and recording atmospheric data as well as other data that is essential to producing a quality blast and paint job. We have extensive knowledge and access to various coating products from partner companies. Our professional painters are experienced with a wide variety of coating systems. 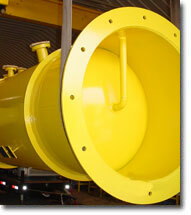 We specialize in offshore multiple coating systems. We can spray airless or conventional. By blasting and painting in house we can reduce the cost of any project. This also allows us to reduce the lead time for your project by eliminating the need to ship it back and forth for blasting and painting services.